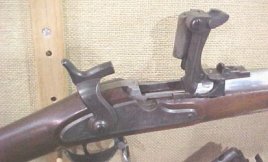 After a considerable amount of prototype testing, the breechloader submitted by Erskine S. Allin, Master Armorer at Springfield, was selected for its simplicity. Also, it could be inexpensively assembled using many parts from CW muskets. At this time, and for many years after the War, getting funds for new ordnance projects was a major problem. 5,000 of Mr.Allin's rifles were made and given the nickname "First Allin." 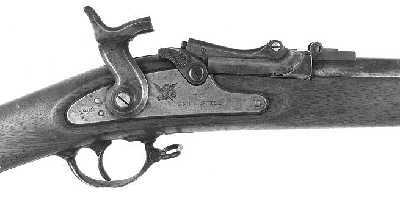 The gun design was based on using Model 1861 muskets for its construction. Only the stocks and barrels had to be modified. The breech of the barrel was opened and fitted with a breech block which hinged forward, thus the name "trapdoor." The stock had to be cut to accept the ejector and extractor mechanisms. This process left only a very thin portion of wood covering the mechanism on the lockplate side of the stock. If a rifle had been used in service, this piece of wood is usually missing. The rifle was chambered for .58-60-500 rimfire cartridges. CW locks, stocks, barrels, trigger assemblies and bands were used in their production. This made the actual production cost ($5.00) far less than the cost of a new rifle.